Jackpot.com provides a ticket purchasing service to lottery players across the world who want to participate in famous lotteries like US Powerball, Mega Millions, Euro Millions and so many more. Jackpot.com was founded in February 2002 which is operated by My Lotto, based in the UK. You can play your favourite online lotto with Jackpot.com as they have over 20 offices worldwide. In fact your tickets are purchased on your behalf by Jackpot.com staff from official lottery retailers. The site can be translated into 14 languages that include English, Spanish, French, Italian, German, Chinese, Japanese, Russian, Swedish, Portuguese, Polish, Romanian, Hungarian and Dutch. The website can be set in five currencies and these include Euro, US Dollar, Sterling, AU Dollar and Ruble. It is their pleasure to make your impossible dreams become a reality, by playing your favourite lottery, making it enjoyable and exciting in the comfort of your own home. The Jackpot.com website is user-friendly, simple and easy to navigate, giving you the chance to win millions in various online lottery jackpots. There are approximately 85 lottery games, some of which offer big jackpots that can be played anywhere around the world through Jackpot.com. Jackpot.com also offers online Australian lottery games such as Powerball Lotto, OZ Lotto, Monday Lotto, Wednesday Lotto or Saturday Lotto. Each Lottery has some information on how to play the online lottery and the jackpot prizes. On clicking the lottery you want to play, you can find the countdown which shows the time left for the next draw to take place. In order to play your favourite lottery, all you need to do is sign up to Jackpot.com. On signing up, you can enjoy playing any online lottery at any time, any place. Once you select which lottery to participate in, select the numbers you want to play or by using Quick pick, the numbers are chosen for you, finish the sign up by purchasing your ticket via the payment section. A representative from Jackpot.com will buy the ticket on your behalf, which is scanned and sent to your account for you to see. It is important that every ticket has a serial number together with the date, time and place of purchase from the official retailer, so it can be easier to validate. Once the ticket is scanned, it is stored in a secure safe in their office. If you happen to win a prize, they will notify you by email or with a text message alert, even if they are secondary prizes. You can be rest assured that the entire prize amount is transferred to your account safely. If it is a large amount of money you may need to travel to claim your prize. On subscribing you can view the transaction history such as your past ticket numbers, multi-draws, deposits, withdrawals and wins. You also receive jackpot alerts, lottery results, any new loyalty promotions that may be of interest to you or any jackpot winnings. If you have any queries, they are sure to be of help. Buying tickets for your favourite lotteries has never been so easy, Jackpot.com offers you discounts of up to 20% on your lottery ticket purchases. 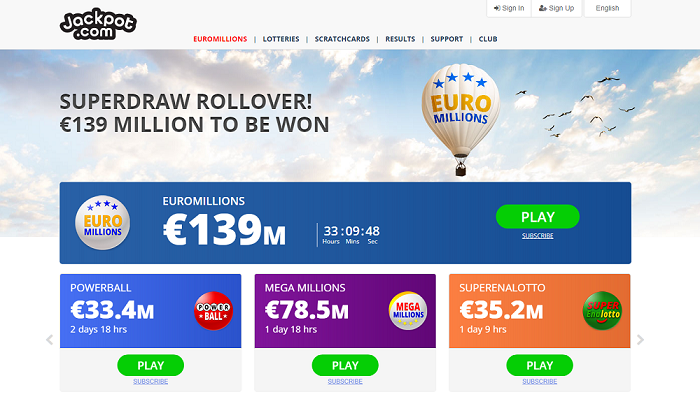 Buying tickets on EuroMillions and UK Millionaire together will help you save 10% off the total price, you can get further discounts when buying Mega Millions ticket too. Being a frequent or loyal lottery ticket buyer, most definitely pays you! Jackpot.com has an awesome VIP loyalty progam, with every $1 spent you automatically earn 1 VIP point. The more lottery tickets you buy, the more points you earn. In fact for using VIP Club starting with the Bronze level till Diamond level you benefit discounts from 2% up to 20%. When buying lottery tickets in advance and playing as many consecutive draws for multi-draw packages you can save up to 25% discount. When you invite a friend to play the lotteries through Jackpot.com you get a $10 bonus for recommending and your friend get 5$ bonus. A free subscription to your favourite lottery, automatically enters in every consecutive draw until you cancel it. Every 10th lottery ticket is free with 25 VIP points in which you can change the numbers at any time. You have a choice to put the subscription on hold and reactivate it under the subscriptions section. On signing up, in the payment details section, you can set your currency. In fact, it supports five currencies US Dollar, Sterling, Euro, Australian Dollar and Ruble. Payments will be made as per your preferred currency. Jackpot.com accepts two payment processes the credit or debit card and e-wallets. Depositing funds for payment via credit or debit card include Visa, Mastercard, Diners Club, Discover and Maestro. They also accept e-wallets such as Skrill, Neteller, Ukash, Webmoney, POLi, Sofort, Paysafecard, Giropay, Trustly, Nordea, Entropay, Postepay, Postepay, iDEAL, Bleue, CartaSi, Direct Debit, ePay.bg and Polish banks. If for some reason, you are unhappy with the service, they will refund the purchase you made. You can have peace of mind that your tickets are stored safely and payments are secure through the site. All transactions made through Jackpot.com are protected by GeoTrust SSL security certificates so it is 100% secure. The website is spam free and monitored by Return Path. Jackpot.com customer service is open 24/7, via email, chat or telephone. They offer live chat help in 15 languages by their friendly and professional team. The Customer care team offer a quick and informative response for any questions or comments you may have.